Helena Koczur stands by her display window full of her most valued pieces from past photoshoots. 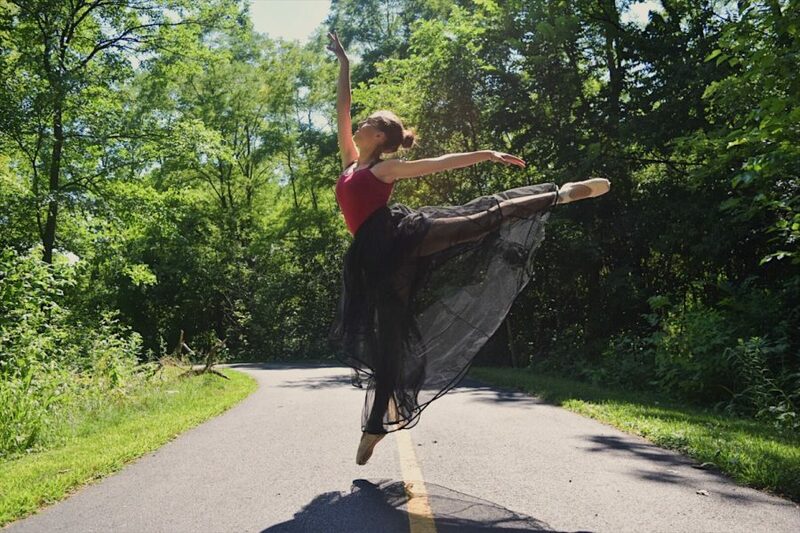 Senior Jacki Riek dances in front of the lens for one of Helena's photoshoots. Among all of York’s outstanding programs, the art department has always been a place for students to be creative and show off their talents. Dozens of Dukes are enrolled in art classes here at York, from entry-level classes, such as Photo 1, to AP Art, sharing their passion for art with the rest of the school. Among these talented set of students, senior Helena Koczur is shocking the school with her deeply rooted photography skills through the AP Art program. 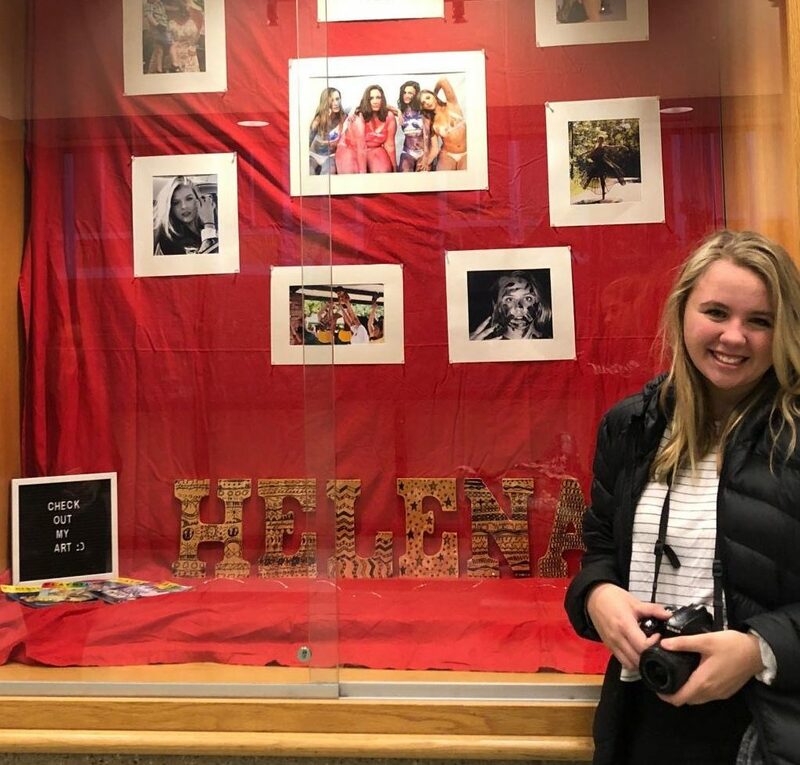 After building a background of photography throughout her childhood, Helena took Photo 1 and 2 her freshman and sophomore year to further her skills and strengths. Although she didn’t have room in her schedule for AP Art junior year, she was encouraged by her teacher, Mr. Edgley, to apply her senior year. While most think it is completely worth it, the application process is difficult; however, this seems to reveal the impressive skills AP Art students have. Helena is constantly working on projects throughout the year, some of which can be seen in the display windows near the senior courtyards, featuring many of York’s own dukes. While many Dukes pass by with amazement, they don’t necessarily see the months of hard work and thought that go into each display. Other than what is displayed in Helena’s window, Koczur has shown to have certain preferences for the subject of her photos. While ranging in subject focus, Koczur expresses her favorite being people, photographing a range of models, including her friends. Now, Helena is working on a project called a concentration, something all AP Art students must partake in. A concentration is a portfolio for the college board of 12 pieces that fall under a certain theme, Helena’s being ‘stars’. By working on projects like these, Helena and all other art students are able to transform their work into meaningful pieces to share with both their fellow dukes and possible future employers. “I’m not going into [photography] as far as schooling and college but I definitely want to keep it in my life whether it’s just doing it on the side, like during the summer getting [sic] shoots of families for family portraits or whatever,” Koczur said. While keeping up with York’s other programs, such as the drama program, Koczur expresses how photography has always been different for her than any other extracurricular activity that she’s done. With brilliant pieces in her portfolio and another on its way, Koczur has a lot planned for her senior year as a duke. Be sure to check out her display window outside of the courtyards to check out her work, and stay tuned for another This Is York ‘Under The Monocle’ about another one of York’s own AP Art students.